24/7 EPISODE 1 - PACQUIAO: "I HAVE TO PROVE THIS FIGHT THAT HE'S WRONG"
HBO's award-winning franchise "24/7" returned tonight with the premiere of "24/7 Pacquiao/Marquez", the all-access reality series following pound-for-pound champion Manny Pacquiao and lightweight king Juan Manuel Marquez as they prepare for their November 12 showdown at the MGM Grand Garden Arena in Las Vegas, Nevada. "I have to prove this fight that, you know, he's wrong...I feel confident in myself, but I'm not underestimating him," Pacquiao would comment, making it clear that he too is on a mission to prove once and for all that always has been and always will be the superior fight. 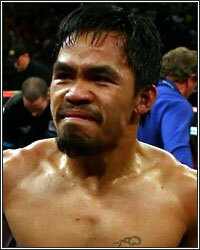 Check out what else Manny Pacquiao had to say in episode 1 of 24/7 Pacquiao/Marquez. "I have to prove this fight that, you know, he's wrong." "I always having fun in training and in boxing, and I think it's because boxing is my passion." "It's helped me a lot because Linares' style is much simliar to Marquez's style. Linares is much faster than Marquez." "I'm amazed because after a few rounds, he fight back and, you know, still strong." "I'm confident that I won that fight and when I heard the decision is a draw, I mean...you cannot change it." "He caught me in that second round, but I can handle his power." "You know, after the fight, what I feel is my legs cramping in that fight. I don't know why." "After the fight, I'm looking for a good conditioning coach; that's why I hired Alex Ariza." "I feel confident in myself, but I'm not underestimating him."